The Simplicitly theme for WordPress by Performancing is designed to be easily customizable, without compromising on aesthetics. 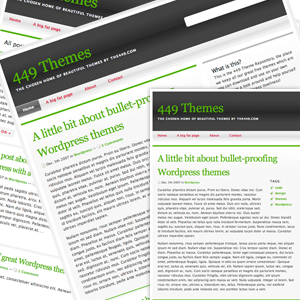 It’s the perfect starting point for any WordPress blog. It’s a simple theme, with a hint of Magazine style, that is easy to build upon and is easily customizable through support of widgets and super-clean code. Simplicity is engineered to be highly accessible, work beautifully with a screen reader and uses the hAtom microformat. Simplicitly is built to the latest WordPress functionality with full support for built in tagging and widgets. Simplicity is the first collaboration by Performancing with the449, a UK-based collective of designers. Simplicity was conceptualized and executed by the449, and is being distributed by Performancing under the Performancing Themes for WordPress brand. Update: Simplicity has been updated for compatibility with WordPress 2.7 and up. Download the latest version here. View a live demo of the theme here.